What Can The Blood Evidence Tell Us? It is the job of crime scene investigators to analyze a crime scene and examine/gather various types of evidence that may be used to piece together a possible series of events. One type of useful evidence, particularly in the case of violent crimes, is blood spatter. An investigator experienced in the analysis of blood spatter can use physical observation as well as mathematical measurement in order to help support or refute possible witness accounts of the crime or, when no witnesses are available, provide insight into events that may or may not have occurred at the crime scene. In this activity students will work through a series of five stations and examine various aspects of blood spatter analysis including the effect of falling height on blood, the appearance of blood that impacts a surface at varying angles, some common blood spatter patterns that may be present at a crime scene, the effect of impact velocity on blood spatter, and the manner in which various surface type/texture may affect the appearance of blood evidence. 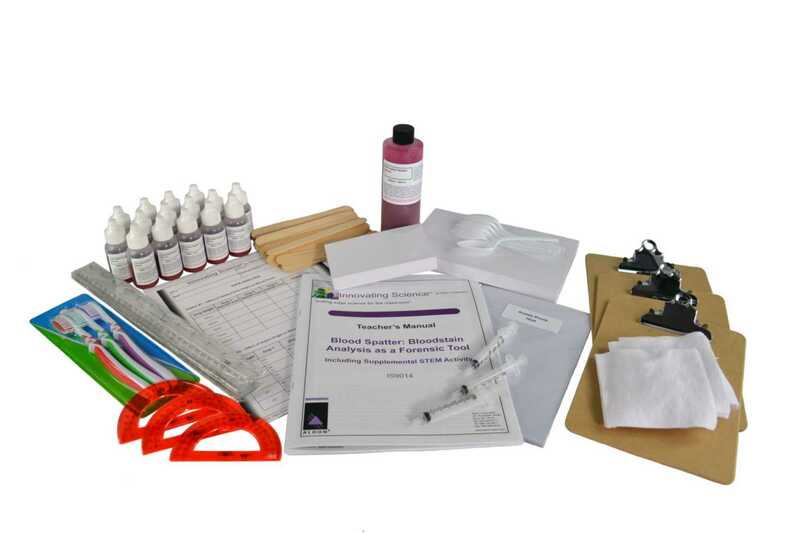 Ordering information: Includes Simulated Spatter Blood, Small Index Cards, Large Index Cards, Rulers, Protractors, Clipboards, Syringes, Tongue Depressors, Toothbrushes, Acetate Sheets, Cloth Squares, and Teacher's Guide and Student Copymaster.